The easiest, quickest way to learn about Retrograde Venus! Can a 3-minute video explain how to use the secret wisdom of Retrograde Venus to improve your life? Why is this Retrograde Venus kicking me so hard? Venus Goes Retrograde, turns "east," perhaps once every year, year and half, as an example. This year, 2012, it's almost retrograde in Gemini, even now. What can be done to minimize the effects of Venus appearing to travel backwards? What can be done to make the most of this time? Previously, I've offered a series of Mercury Retrograde Meditations and the Mars Minute. 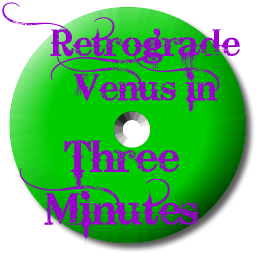 This particular Retrograde Venus isn't too horrible, not for the astrologically prepared. Three minutes of meditation with the accompanying sound track will alleviate all Venus Problems. The deal, it's like an astrology reading with me, plus much more. Targeted at a minute -- a bargain. As a video, you can pause, rewind, jump forward. Load it on your laptop, iPod, take it where you want! The stars have power to influence events. Learn to decipher the meaning. Venus is odd, as planets and planetary (astrological) influences go. Borrowing from rather diverse sources, it's either a planet of love, or a planet of war. The mechanics are easier to grasp. The orbit of Venus takes roughly 260 days. The orbit of Earth takes 365 days (more or less). The first observation, be astronomical or astrological, Venus is never more than 40 degrees away from the Sun. That's because its orbit so closely falls within ours, and because Venus is between Earth and the Sun. Simple mechanics, Venus circles around in between here and the center. From an astrological point of view, practically, this means that about every year and half or so, Venus tends to look like it is moving in direction that isn't consistent with the rest of the planets or any of the fixed stars. That's called "retrograde." In more traditional Western Astrology, Venus is the "Love" planet. Its influence is equated with passion and heart, perhaps lust, as well, but mostly through Greek and Roman mythologies, the association is amorous in nature. Because of its physical proximity, in astronomical terms, Venus doesn't appear retrograde every year. When it does go retrograde, it tends to wreak havoc on relationships. Typically, these are relationships off to a rocky start, or perhaps it's a romantic relationship that never had a chance to begin with. Problems with romance? That's the easiest answer to delineating Retrograde Venus. Retrograde planets in general, and the inner, personal planets, in particular, have signatures and patterns. Venus is about romantic love, and the Retrograde Venus pattern is about what happens with romantic love. The other caution is Retrograde Venus means it's time to stop and assess matters that have to do with tastes. Retrograde Venus means it's a good time to address an issue that needs attention but has been put off until a later date. Retrograde Venus is the later date. Approximately ten percent of the population will have a natal Retrograde Venus, and that has space for a different interpretation. The simplest, easiest way to explain natal Retrograde Venus is to understand that romantic relationship are, at best, difficult to figure out. Might take a while to grasp meanings. Frequently, a person born with a natal Retrograde Venus takes longer to grasp the nuanced language of love. The Retrograde Venus is nothing to fear, but the semiotics should be quite clear. Relationships tend to suffer under this influence. While it's a natural progression of the planet's cycle, it is a time to pay attention to the little details that make relationships run smooth. As an aside, or perhaps as a side bar footnote item, when operating under a Retrograde Venus? Watch out for matters of aesthetics. The last time Venus was Retrograde, as a very singular example, a dear friend painted her kitchen. The color swatch in the store and the color once the kitchen was painted? Two completely different shades. Perhaps it was the lighting, perhaps the color was mixed incorrectly, but it took three tries to get that kitchen painted right. When there is a Retrograde Venus? It's a bad time to pick a new color for the living room. However, if the color is already selected? It is a good time to do the work. Aesthetics, like relationships, are best left alone when Venus is Retrograde. Here's where you go to gather the spoils, we've got one location set up -- with multiple formats.